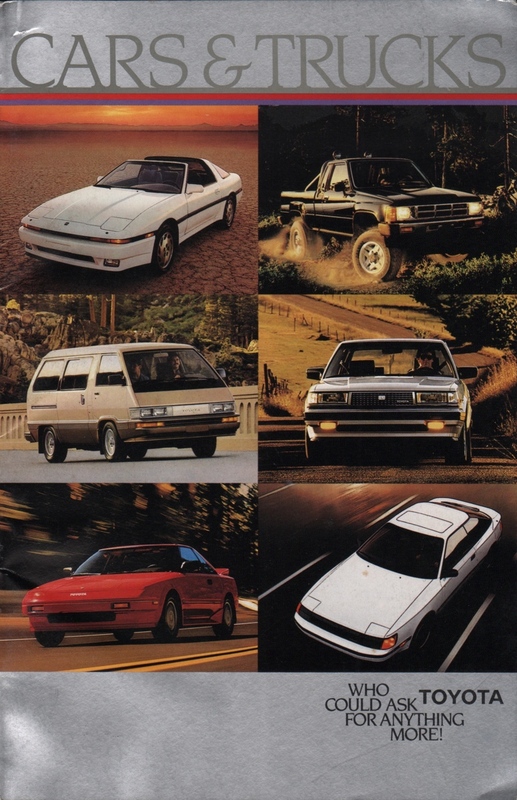 Sales brochure for the 1986 Toyota Cars & Trucks. Models featured includes the Toyota Supra, Celica, MR2, Corolla GT-S, Camry, Cressida, Corolla, Tercel, Wonderwagons, Cargo Vans, 4X4 Trucks, 4Runner, Sport Trucks, 1 ton trucks, camper cab/chassis and commercial cab/chassis. Brochures are presented for research use only. Company marks, emblems, and designs are trademarks and/or service marks of Toyota.